The other game Capcom announced at PAX East other than DuckTales was another compilation of arcade classics. This time, it’ll be both Dungeons & Dragons beat-em up’s packaged in one game. 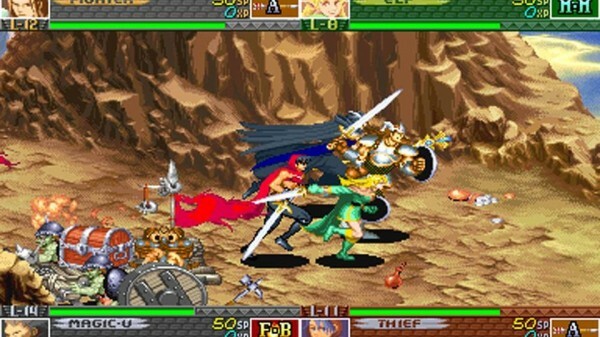 Dungeons & Dragons: Chronicles of Mystara collects 1993’s Tower of Doom and 1996’s Shadows of Mystara. Both brawler’s are set in D&D’s Mystara world. You’ll be able to play 4-player drop-in/drop-out co-op, a challenge system and it’ll be running on Capcom’s GGPO online. There’s also a new ‘house rules’ system where the gameplay will dramatically shift from normal to time attack and more mechanical changes. It’ll be coming to XBLA, PSN and Wii U e-Shop with exclusive GamePad features this June for $14.99/1200 MSP. Let us know what you think about these arcade brawlers in the comments or post in our forums.